Iterative hashing of a private random seed can yield keys for use in HMAC, which if revealed publicly in reverse order and on predetermined schedule, can be used in a manner similar to other asymmetric key signing protocols, where released intermediate key authenticity is verifiable in terms of its relationship to the first released (last in chain) key. The seed is like a private key, and the last of the chain (first released) is like the public key. Useful elaborations are possible, e.g. using hierarchies instead of chains. Motivations for DCKR include the familiar motivations for other asymmetric signature algorithms such as RSA and DSA, since the first three goals overlap. DCKR may have additional advantages over other asymmetric algorithms, whenever one or more of goals 4-8 also apply. For example, privacy or fungibility considerations might imply that delegated signing authority must yield signatures indistinguishable from non-delegated signing authority, or else that signatures must expire. Functionary restrictions or fork resistance intended to improve governance and resist corruption might imply that signing or delegation authorities must expire on a cryptographically enforced schedule. Wallet or custodial use cases might require ad hoc yet time-constrained delegation of signing authority. But perhaps most importantly, $100 billion market capitalizations might call for an enhanced degree of cryptographic conservatism, especially as we head into the new age of quantum computation and resulting uncertainty about the pace and nature of future cryptanalytic results. Unproven assumptions such as the computational hardness of factoring, or discrete logarithms, or R-LWE, etc inherent in other popular signature algorithms may become untenable. (Two of those three are already known to be vulnerable to quantum computation, and the third is not known to be quantum resistant to my knowledge.) The deliberate consolidation of the number of unproven mathematical assumptions underlying a cryptographically secured system may reduce the risk of breach, may expedite swapping of primitives in event of cryptanalytic surprise, and may reduce attack surface while enabling the redundant yet efficient coverage of critical system components. It should be noted that this is not the first hash-based signature scheme proposed which is believed to be quantum resistant under assumption of cryptographic hash function preimage resistance. Lamport signatures, first proposed in 1979, are another example. Although Lamport signatures suffer various severe practical limitations, some of these have been partially or fully addressed, yielding other variants. (Perhaps I should add a comparison in an appendix.) I am however not aware of other practical hash-based signature schemes covering all of goals 1-8. Let K(i) be the ith iteration of H on s, such that K(0)=H(s), K(1)=H(H(s)), etc. To produce an expiring signature on data d, the signer computes HMAC(d,K(S-1(t)-1)). 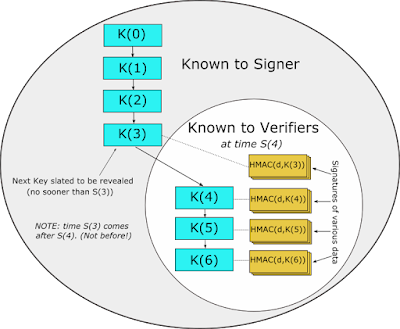 Notice that verifiers cannot yet verify this signature since they do not yet know K(S-1(t)-1), and the preimage resistance of H prevents them from deriving it from K(S-1(t)) or any other knowledge that they might have. They can however be assured by schedule S that, should this signature later prove valid, no one other than the signer could have produced it at the time that they first observed it. If signature expiration is undesirable, then an immutable blockchain with approximately known and trustworthy block time stamps may be used to document creation of signatures prior to associated key publication. For example, HMAC(d, K) could be committed to the current block either directly or indirectly (e.g. as member of a Merkle tree whose root hash is contained within the block, perhaps by encoding within a Bitcoin transaction for example). If there is uncertainty in the timing of blocks, then the interval between signature publication must be large relative to that uncertainty. The public blockchain in such an arrangement additionally serves to inform verifiers who were offline during relevant time intervals. Hybrid functionality is also possible. For example, hashed data (even without signature) could be committed to a private dedicated blockchain that lacks proof of work, proof of stake or similar immutability mechanisms - and instead is secured by a signature on the most recent block that is taken to indicate authenticity and correctness of the chain. The entire chain may then be efficiently renewed just by issuing new signed blocks, or else the entire chain may be allowed to expire just by waiting for the top most block's signature to expire. At time S(0), the private key s expires and becomes cryptographically useless. This might be desirable or undesirable. If expiration is not desired, then the protocol could provide that at any time prior to S(0), the signer may sign some new K’(n) based on a different random seed s’, which is then understood to represent the next public key when i reaches 0. Indeed, the next K’(n) could be first publicised as early as time S(n). If desired, even multiple such K’’(n) and K’’’(n) could be advertised as early as S(n). In this way there is much flexibility in the size of n and the duration over which verifiers may first become aware of future public keys. This flexibility may be useful for example as a performance and storage optimization, so that excessively many iterations of H are not required with each signing. This may be useful for a variety of potential reasons. As one example, it could be useful in the unlikely event that dangerously large entropy loss with large n is discovered to accrue due to the “random” (or not-so-random) collisions within H.
A signer can delegate signing authority of course by handing over the private key s, just as with any signature scheme. 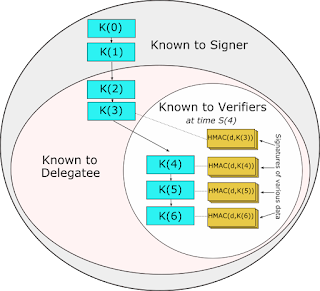 A signer however could also delegate signing authority which automatically expires at time t, by handing over K(S-1(t)), since all earlier keys can be efficiently derived from K(S-1(t)) through simple iterative hashing. If this feature is to be safely used, then the protocol would need to specify extra precautions around renewal of s. For example, even if published early (perhaps even time S(n)), the protocol could mandate that the new K’(n) must be signed by S(0) to be valid. In this way, anyone entrusted with advanced knowledge of K(i) for any i > 0 for purposes of delegated signing would not be able to specify a new K’’(n) for purpose of indefinitely hijacking the trust relationship. 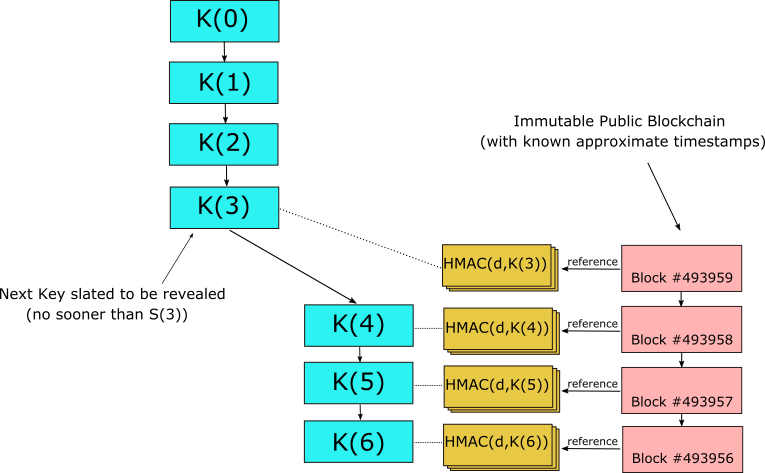 The chain of keys can be converted into a hierarchy of trees through the addition of securely random salt at each branch point. At the time of scheduled merge, the salt would then be publicly revealed by the delegatee along with the parent hash, so as to prove valid derivation. If there is a need to not reveal the structure or existence of delegation, then random or standardized key branches could be routinely introduced and utilized regardless of presence or absence of actual delegation, and this could be done either voluntarily or else by mandate of protocol.